This is the first in a series of tips for more effective communication. Call to mind your intention for an interaction. It’s powerful to name your intention for a conversation, at least to yourself, the person you’ll converse with, or others. By consciously declaring your intention, you are more likely to move toward this picture. For those more challenging relationships, it is useful to remind yourself frequently. For example, you might say to yourself, “Jeff and I are communicating clearly and building a trusting relationship. We experience an oasis together and create great results together.” In addition to seeing a picture, it is useful to notice how you are likely to feel in your body as your intention is realized. Perhaps you notice yourself relaxing and feeling more playful as you envision your intention being fulfilled. As you shift your body position, you will be more open so Jeff is more likely to experience you as such. When my intention is to create an oasis-like environment with my coworkers, I remind myself of my oasis image. An oasis is a refuge in a desert area made fertile by the presence of water. It is a peaceful place in the midst of turbulent surroundings. Perhaps you have been somewhere like that and have even called it an oasis. Or you may want to imagine a place in nature that you find beautiful and peaceful. 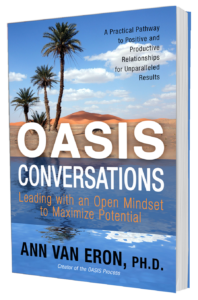 I recall that I want to use the OASIS Moves and skills to create an open, respectful environment where my conversation partner and I are both relaxed and can understand what is most important. Then we can develop solutions where we both feel like winners. I want to build a satisfying community around me of people who can come to agreement on goals and actions. I want to understand others and to be understood. I envision satisfying and productive relationships. Try to assume positive intent. Remind yourself that people are generally doing the best they know how. Even behavior you perceive as intended to hurt may not be what it appears. I find that often people are reacting to challenges in a system and simply don’t know what to do. For example, some people feel that in a competitive environment, they need to be competitive. Make it your goal to stay open and create a sense of openness and curiosity in the interaction. Notice your judgment and hold off from taking any action you may regret later. Be aware of the current situation as well as the long-term intent for a relationship. If a person has not completed a report she promised, try to figure out how to get it completed. How can such situations be avoided in the future? Every interaction can be an opportunity to strengthen the relationship and support achieving goals together. Once you have worked through a potential misunderstanding, disagreement, or even a failure to deliver on a task, the two of you have a history to draw on. You will have the confidence that you can work things out together as a team. What is an oasis for you? A friend told me that when he was in Morocco, he would drive in the stark desert for miles, and then quite suddenly, he would see an oasis. Out of the hot bleak desert would emerge large palm trees, water, and a whole town of aliveness. The contrast between the arid desert and the green lush oasis really stood out for him. Janet, a friend, imagines a beach house in Sanibel Island, Florida, where she visits annually as a place of safety, nurturance, and rejuvenation. Develop your own picture of an oasis. For me, an oasis conjures up an image of a holiday with palm trees, beautiful nature, warmth from the sun, nourishing fruit, and refreshing water. It is a place where I feel relaxed and open to possibilities. I like to feel that way in my conversations. When I am relaxed and open, communication is more satisfying and productive. My goal is to support myself in being open and in feeling like I am in an oasis of abundance. Such feelings are contagious and encourage others to be open, too. When we can stop ourselves from being closed or judging, then we can open ourselves to experience an oasis with others. I remind myself that I am confident and I can handle whatever comes up in a conversation. I trust that after learning the OASIS Moves, you will feel the same way. Jackie, a leader I coach, was perceived by her coworkers as harsh, too quick, and unapproachable. Her intention was to create a more welcoming, oasis-like environment with her staff and colleagues. Her image of an oasis was relaxing in an outdoor café in Italy with friends. As she set the intention of experiencing such an oasis with her colleagues and learned the OASIS Moves, we saw dramatic improvement in her interactions. She was able to be calmer and refrain from making judgments, so people felt less defensive. Using OASIS, Jackie caught herself and refrained from responding with quick-witted barbs that made people feel inferior. Instead, she became interested and listened to colleagues. At first, they were surprised, but then they welcomed her listening and more open manner. Within a remarkably short time, her reputation became more positive. Her staff believed that she was really listening to them. She really was open for dialogue and their suggestions were taken. The whole tone of the department changed to being more relaxed. Soon even clients remarked that they sensed a difference—an openness to new ideas and innovation. When you are skilled at creating this kind of experience in your interactions, you will be effective in creating the results most important to you. This entry was posted in Communication, intention by Ann Van Eron. Bookmark the permalink.